I promise that we don't spend all of our days eating cookies, treats, cakes and decadent breakfasts. Only with two little kids I've found it quite a challenge to ever get a photograph of anything we eat for dinner as I try to diminish cranky, grumbling stomachs while plating four plates all with different tastes (lots of peas for Canaan, no chicken for Eden, etc.) all while the sun sinks lower and lower. But the other night we started early as Nate had a huge chunk of meat to grill slowly on our outdoor grill. 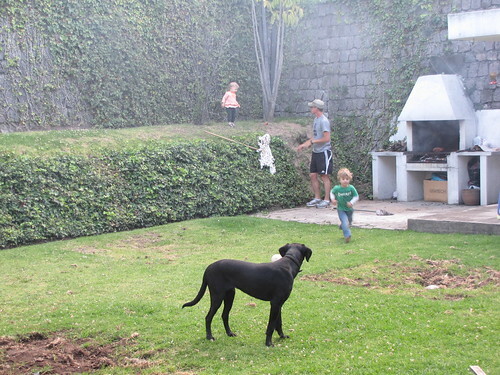 And the kids were playing nicely, covering themselves in charcoal and dust, while I prepped what's definitely the most quality dinner salad we've eaten in awhile with our haphazard nights and schedules. And when I popped out to check on everyone the light still seemed good enough so I grabbed my camera for a few quick snaps against my children's lovely chalk art. And I'm glad I did because this salad was worth documenting. 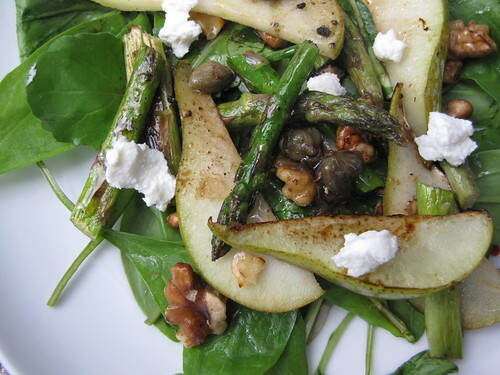 The pear and asparagus are still bright and crisp after a quick saute. The tangy dressing, peppery arugula and sweet pears give you so many flavor sensations in one bite. And anytime I eat goat cheese and walnuts together nothing can really go wrong! In a large skillet or frying pan, heat olive oil. Add asparagus and cook for 2 minutes over medium heat. Add in pear wedges and continue cooking for 1 minute. Then add in walnuts and cook for another minute until the asparagus is just tender and pear is softened and browned on the edges. Remove from heat and place on your serving plate. 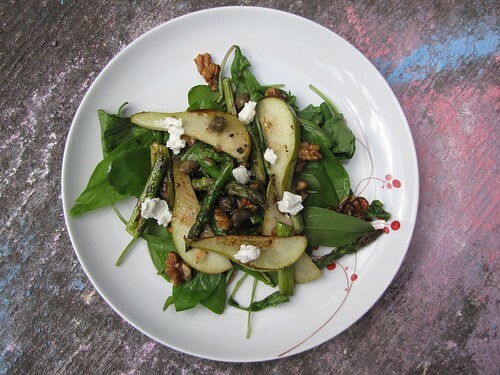 Top with fresh arugula leaves and crumbled feta or goat cheese. Then drizzle the caper vinaigrette over the salad. Serve warm. This sounds (and looks) delicious.